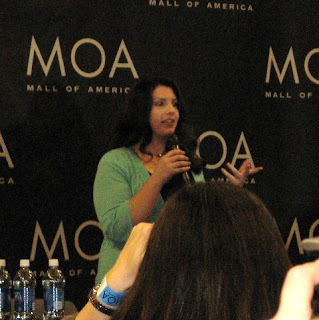 I got a hug from Stephenie Meyer! I was the only one out of the WHOLE crowd who got a hug! And she shook hands with Katie and Jimmy! That too was out of the ordinary! The reason I got a hug was because Stephenie and I actually knew of each other's existence before she published her book, although we had never met in person. I thank the interweb for making acquaintance without face-to-face meetings possible! When I told her who I was, she got up and came around the table for the hug. I was totally surprised by that and so forgot to give her the NCCTs* I brought. Sorry, Stephenie! Anyway, on to a few pictures. Maybe even a video in a later post!!! Q and A session--She was personable, funny, and at ease; and she seemed to connect with the crowd. She was gracious to everyone who came to see her. Her hair, by the way, is AWESOME. 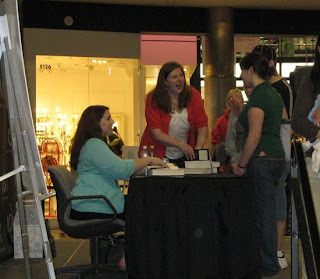 Katie (in the green shirt) and Jimmy (behind katie in the blue baseball cap with yellow piping) meeting Stephenie. AAAAAHHH!! I'm still so excited about it all. I hope you have written all about it in your journal!! I can't wait to tell my students today! Please explain to an out of touch father who Stephanie Meyer is and how she knew of you and why (not that she shouldn't know of you). 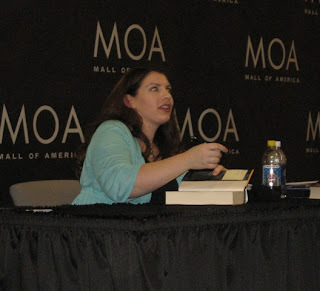 She and I are members of a small message board and when I posted on this board that I was thinking of going to the book signing but wondered if Stephenie would know who I was, she posted back and said she would absolutely know who I was. And she did. And I got a hug. And the people behind me in line were very jealous. Katie can never call me not cool ever again. Stephenie is five rows down, second from right. How is her hair awesome? It always looks nice in pictures, but what about it made you comment? My word verification - iwsxy!! Now I'm not. She has long, thick, wavy hair. I'm jealous of it. The optimal word being FEMALES. So sorry to be so out of touch. I don't like Time mag anyway. Oh Wow! I am soooo jealous. How cool for you to be able to go. Emily and I were contemplating a trip up to Forks, just to check it out. Your dad - sheesh!!! Even Uncle Bud has read the books. He got tired of Emily and I talking about it and not being able to express an opinion. SQUEEEEEE is right!!! so fun. 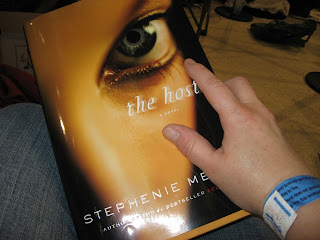 I just got the Host in the mail today and I am so excited to read it. BTW, a friend here in des moines grew up with Stephenie, smae street, same ward...kinda cool. she is the one who first introduced me to the twilight books.ps. josh read them and absolutely loved them too.